Our engineering capabilities and manufacturing processes allow us to design and build top quality products for any conceivable application where reels are needed. Customize fluid paths/axles or create custom brackets, mounts, and accessories. Integrate with your specific hardware, systems, or devices. Modify drums, add divider disks, manipulate openings, or integrate hose handling devices. Combine features of various reel model lines, creating your own hybrid reel. Increase temperature and pressure capabilities, or multiply fluid paths. 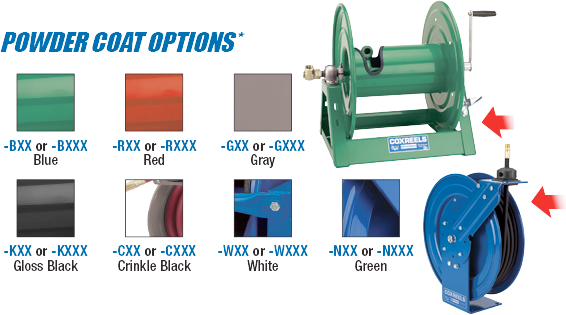 CPs & CCRs :: Coxreels offer two types of custom products. CCRs and CPs each offer specific benefits to our customers. 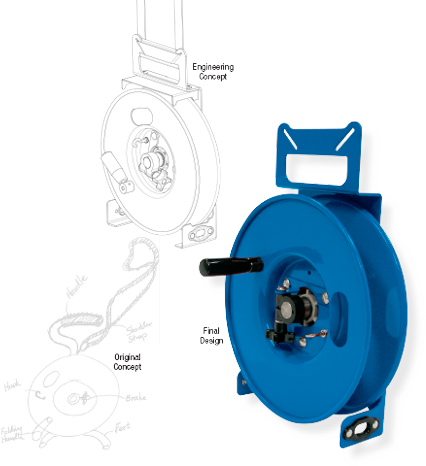 CCRs or cox Custom Reels are custom reels assembled out of existing components. CCRs allow customers to combine features of various reels and create completely new reel lines. 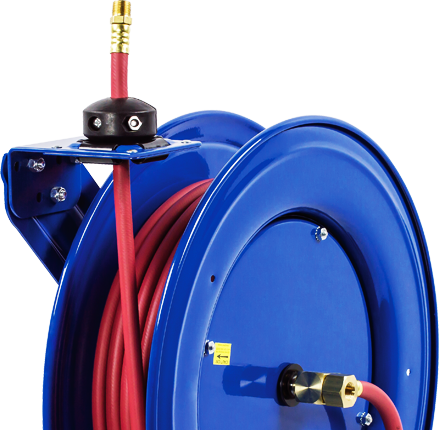 CCRs range from simple request of swivel size changes and hose combinations to a new dual hose side mount reel built by combining our MPD-N-430 with th emountin gof a SG17-430. CPs or Custom Products are custom reels that fall into a more demanding category that allows customers to request completely custom components and assemlies specific to their application. CPs include simpler items like custom powder coat colors and new special hoses and also more complex requests in the vein of new interfacing brackets and frames, or divider disks and even new mounting bases. CPs allow OEMs, factories, and industry specific companies to get a leg up on their competition by having a reel incorporated into their product or service only available to them. Match the right color, incorporate your own drive system, or develop a new product just for you! To add any of these options to your reel simply suffix the option number after the model number. Consult factory for more options.